As we continue our interviews with racers who attended the Racesaver IMCA Sprint Nationals, we speak with the man who finished second in the Sunday night A Feature; Blake Robertson, a 41-year old from Visalia, California. Q: You managed to work your way up to second in the finale, ending a great run at the Nationals. To what do you attribute your success there? Blake: I think that confidence in your car is huge, just having that helps a lot. We do have a track out west here that has some similarities to Eagle Raceway, so I take the notes that I have from there and apply them at Eagle. I also watched videos of the track; that really helps as the local racers are really fast there. Q: What was your favorite part about racing the Nationals? Bart: Getting to meet new people, seeing old friends and racing against the best in the country. It’s also amazing to watch how efficient Roger and his crew run the entire show. Q: You’ve run 360’s and even 410’s against the World of Outlaws. Why do you enjoy the Racesaver sprints so much? Blake: The cost of the engine and the longevity of it is so attractive. With the motor rules and regulations, it makes the playing field very even. Q: Is there a big difference in the set-ups between a Racesaver sprint and either a 360 or 410? Blake: Not too much difference; just ride heights basically. 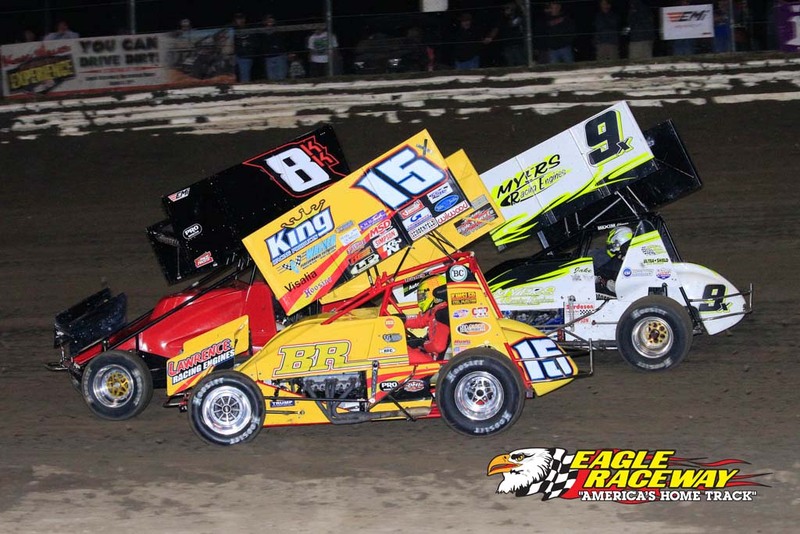 Q: Is it difficult to make the transition between racing 360’s or 410’s and the Racesaver sprint? Blake: Not really for me. It just takes a few laps to get the different feel. Q: What did you think of the 3-wide start? Blake: I have only gotten to do it once and with the track being as wide as it is and the caliber of drivers involved, it was awesome! Q: Anything that you would like to say to the fans and racers who haven’t made the trip to the Nationals yet? Blake: This is a must-attend race for both fans and racers. We travel over 1600 miles just to attend! The racing is awesome and the track is fast. If you want to test your skills against the best, then the Nationals is where you need to go! !